Cuyahoga Valley National Park was only given national park status in 2000, but its history runs farther back in time. It is a wonderful location to enjoy the surrounding nature, as well as learn about historic commercial trading and business. Travelers of Ohio are often surprised to find a national park in between the bustling cities of Akron and Cleveland. When they do, it is not uncommon to feel uncertain about what to visit or do. 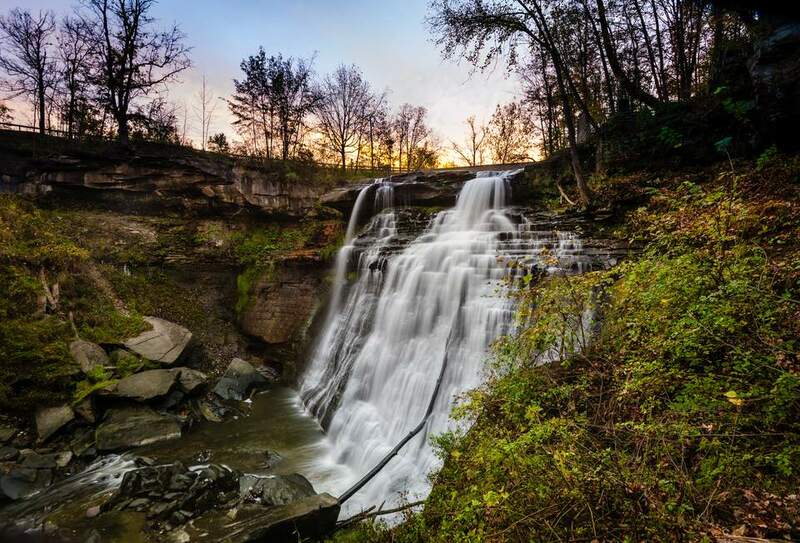 Have no fear; if you only have one day to tour Cuyahoga Valley National Park, follow this itinerary for a fun-filled day for you or the whole family. Start at this national natural landmark which has been eroded to a depth of 896 feet. It is the largest tributary to the Cuyahoga River and flows through four of Ohio’s counties. Trails lead to a wonderful overlook presenting views of the wooded valley as well as the creek 200 feet below. The origin of this waterfall's name may not be surprising once you are in its presence. With a total elevation of 15 feet, the falls has numerous levels of shale ledges, each showcasing a different level of erosion and creating a cascading, veil-like effect. This is a nice spot to stop in the morning to enjoy a quiet breakfast and appreciate the oak, maple, and birch trees surrounding you. If you have two hours to spend, do so on this trail. Known as the heart of recreational activity within the park, this trail runs parallel to the canal that was constructed to be used commercially. The convenience of the canal was replaced by railroads, but the trail has been converted into one of the area’s most popular destinations for biking, hiking, and running. You will pass through forests, meadows, and wetlands, all prime spots to view wildlife and admire the natural surroundings. A quick stop in the nearby village of Boston reveals an 1836 exhibit on the design and creation of the boats that sailed the Ohio & Erie Canal. Nearby is the town of Peninsula, full of charming shops and cafes, as well as a bike rental facility for those looking to ride the Towpath Trail. This is the park’s most visited feature and one that visitors could spend an entire day touring if they have the time. The 60-foot waterfall is the centerpiece of all of the park’s falls and one of the best ways to view it is the Brandywine Gorge Trail—a 1.5-mile trail that lets you explore beyond the waterfall. It starts near a bed & breakfast and follows the edge of the gorge, taking you down to creek level. The trail continues on the other side of the creek back to the top of the falls. And don’t think waterfalls are only for summer excursions. Brandywine Falls is an amazing sight to see in the winter, full of glistening icicles and fewer tourists. This must-see includes ​the main trail that arcs around a small plateau, showcasing the dramatic eroding bluffs of sandstone that is around 320-million-years-old. Walking the trail, you cannot help but feel calm and relaxed by the surrounding tall trees and sounds of chickadees and chattering squirrels. On the east side of Ledges, check out the tight passageways of Ice Box Cave, and feel just how this area got its name. Then move onto the Ledges Overlook, the perfect spot to view a sunset over the wooded ridges of the park. Cap the day with a little human history. Located on Oak Hill Road in the southwestern section of the park, is Hale Farm & Village—a living-history museum. Open from May through October, this museum recreates typical life of the mid-19th century Cuyahoga Valley community. The main attraction is the 1826 farm built and run by the pioneer Hale family. Visitors will enjoy touring this quaint village where ​costumed interpreters weave cloth, make candles, and blow glass. What Was Cleveland's Euclid Beach Park?